Photo Credit: Kevin Parry for The Wallis. 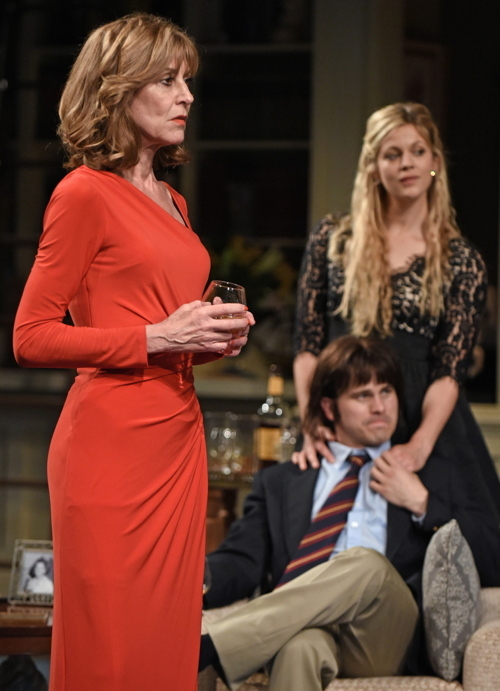 Anthony Giardina’s family drama, infused with comedic moments, is set is the heated world of Washington politics (the play’s title refers to the U.S. capital’s nickname, as dubbed by American author Henry James). The story spans years and six presidential administrations, all roughly charted by a video montage of memorable soundbites of political and topical/pop culture news coverage — President Regan demanding “Mr. Gorbachev — tear down this wall!”; the reading of the verdict of the murder trial of O. J. Simpson; President Clinton claiming “I did not have sexual relations with that woman,” — and so on. Projected onto a wide, white proscenium arch border that frames the stage, the projected video montage precedes each of the three acts. Even so, it’s tough to place exactly where you are in recent history, especially if you are not completely familiar with the events the characters are describing in the ensuing scenes. In fact, it’s not until the third act that the year 2009 is projected to punctuate the imagery. I wish I had had been certain which year each act was set in, as trying to work it out took me out of the immediacy of the drama. In any case, The City of Conversation is a compelling drama, and superbly acted. 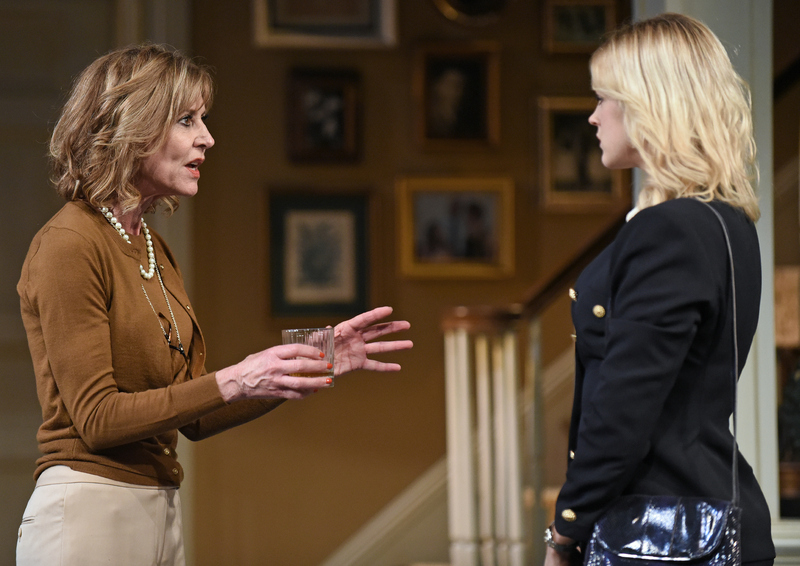 Christine Lahti, in particular, brings humanity and sympathy to her political power player, Hester, a powerful Georgetown socialite who is clearly losing her grip. Lahti gives a great performance for much of the play, but doesn’t successfully convey her advancing age towards the end. Jason Ritter plays her son Colin, and does well with a role that is pretty much an insipid milquetoast; someone very much in the shadow of his nakedly power-hungry fiancée later wife Anna, played well by Georgia King. King does well with a part that is two dimensional. Interestingly, Hester immediately sums up her son’s fiancée as voraciously ambitious and viciously ruthless, though I found Giardina’s insertion of an ‘All About Eve’ reference way too obvious. Giardina’s play celebrates a time when political opposites passionately debated each other by day but socialized at night. It also illustrates how many of the power players struck deals at dinner parties in each other’s swanky homes. (Jeff Cowie provides the scenic design for the single set of a stylish New England colonial-style home.) While the play’s strengths lie in its finely wrought political discourse, the heart of the play clearly lies in the battle between Hester and Anna. The City of Conversation by Anthony Giardina. 2 and 7 p.m. Sundays. Runs through Saturday, June 4, 2016. (310) 746-4000, or purchase tickets online here.